Goodyear employees in Venezuela are each to be given 10 tyres as part of their severance payment, as the US firm halts operations in the country. Quality tyres are valuable on the black market, in a country where there is a chronic shortage of all sorts of goods. A number of foreign firms have pulled out of Venezuela, citing a growing economic crisis and US sanctions. President Nicolás Maduro has accused his opponents and the US of waging an "economic war" on his government. In a statement on Monday, Goodyear said that it "has made the difficult decision to stop producing tyres" in Venezuela, Reuters news agency reports. "Our goal had been to maintain its operations, but economic conditions and US sanctions have made this impossible." 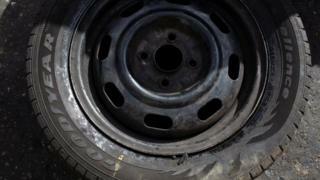 The company said it was in the process of making severance payments, which included giving each employee 10 tyres. Goodyear is the latest multinational to leave Venezuela, following Kellogg, Kimberley Clark and several airlines. Venezuela has been in a dire economic crisis since 2014. An estimated 2.3 million citizens have fled hyperinflation, power cuts, and food and medicine shortages. Over the past two years, the US administration of President Donald Trump has imposed sanctions on dozens of Venezuelans, including top officials. Washington accuses them of corruption, drug trafficking and human rights abuses - a claim they deny.